Throughout his 14-year major league career, John Anderson became accustomed to change. As one of the era's few switch-hitters, one might say he even had a knack for it. 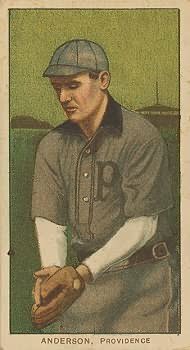 From 1894 to 1908, Anderson played for six different franchises in seven different cities. He played for winners, such as the pennant winning 1899 Brooklyn Superbas (101-47), and losers, such as the dreadful 1907 Washington Senators (49-102). Throughout his baseball travels, Anderson may have accumulated more nicknames than any other player of his generation. He was known as "Honest John," because he rarely protested umpires' calls, "Long John," because of his 6'2" frame, the "Swedish Apollo," for his Scandinavian roots, handsome appearance and muscular build, and also "Big John," in case anyone had forgotten that he was one of the tallest players in the game. A consistent hitter who typically batted fourth or fifth in the lineup and who once led the National League in slugging percentage, Anderson was also an aggressive base runner--his 39 stolen bases tied for the American League lead in 1906. Unfortunately Anderson's reputation took a hit in 1903, when he reportedly attempted to steal an already-occupied second base. Although the evidence shows he was merely picked off first base, stealing an already occupied base--or any other mental blunder--became known as pulling a John Anderson. John Joseph Anderson was born on December 14, 1873 in Sarpsborg, Norway, one of only three players in the history of major league baseball to come from the European country. Sarpsborg, in southeastern Norway, is about 20 miles from the Sweden border, and while Anderson's father was Norwegian by birth, his mother was Swedish. At age eight John immigrated to the United States with his parents and settled in Worcester, Massachusetts, which contained the country's largest concentration of Swedish immigrants. (Anderson would become an American citizen in 1900.) After starting the 1894 season as a pitcher for Worcester in the New England League, he was released in May and signed by the Haverhill, Massachusetts, club in the same league. He was too wild, though, and after one game in which he walked 13 batters and hit three others, he was moved to left field. Anderson played 86 games with Haverhill, batting .354 and attracting the attention of the National League's Brooklyn Grooms. Late in 1894, he was purchased by Brooklyn and finished the season with the club, and batted .302 in 17 games. For the rest of the decade, Anderson established himself as a solid run producer, batting better than .300 in both 1896 and 1897, driving in an average of 80 runs per season, and leading the National League with a .494 slugging percentage in 1898. Thanks to his power and above-average speed, Anderson also frequently ranked among the league leaders in extra base hits, connecting for ten home runs in 1895 and nine in 1898, and leading the league with 22 triples in 1898. In the field, Anderson debuted as a subpar outfielder, posting a woeful .882 fielding percentage in 101 games for Brooklyn in 1895. His defensive play quickly improved, however, as Anderson used his excellent foot speed to track down fly balls in Brooklyn's expansive outfield. By 1897, one publication noted that "Anderson is improving in his fielding and his batting is good, but on the bases he is in the primary class of ball players." Anderson also demonstrated his versatility in the field, filling in at first base for 42 games in 1896, after Brooklyn's regular first baseman suffered a season-ending hand injury. For the rest of his career, Anderson would alternate between playing all three outfield positions and first base. After spending his first three full seasons with Brooklyn, Anderson was sold to the struggling last place Washington Senators on May 19, 1898. Though Washington finished in 11th place with a 51-101 record, Washington manager Tom Brown praised Anderson as "one of the best natural batsmen in the league, and a power at the bat for his team." Anderson played 78 games in center field for the Senators that year, and impressed the locals with acrobatic catches. Anderson's glory days in Washington were short-lived, however. That September, Brooklyn manager Charlie Ebbets announced that Anderson hadn't actually been sold to Washington, he had merely been "loaned" to the struggling team. Anderson went back to Brooklyn. In 1899, Brooklyn, now called the Superbas, finally assembled a championship baseball team. Anderson appeared in 41 games at first base and 76 games in the outfield, as Brooklyn finished with a 101-47 record. Although not the star of the team, John hit .269 and had 92 runs batted in, second highest on the club. Following the 1899 season, Connie Mack, who had signed on to manage the Milwaukee club of Ban Johnson's American League, approached Brooklyn about Anderson. After negotiating directly with John, Connie signed him. Playing for the Brewers in 1900, Anderson finished the season with a .309 batting average and a league-leading 63 stolen bases. Unfortunately for Anderson and the rest of the 1900 American League players, their efforts are not included in their career major league statistics. An open recruiting war erupted between the National and American leagues after the 1900 season, and Anderson opted to remain with Milwaukee. Playing first base for the struggling Brewers in 1901, Anderson had one of his best seasons as a professional, finishing the year with a .330 batting average, eight home runs, 99 RBI, and 35 stolen bases. His 46 doubles remained an American League record by a switch-hitter for more than 100 years, until Brian Roberts, playing for the same franchise but with the Baltimore Orioles, broke it with 50 doubles in 2004. Following the 1901 season, Ban Johnson shifted the Brewers to St. Louis, where they became the Browns, and Anderson had a subpar season in the hitting-friendly AL, finishing the year with a .284 average, 29 doubles, a team-leading 85 RBI, and 15 stolen bases. The veteran Anderson also became something of a team leader on the Browns. His teammates later characterized him as a warm and friendly person who was extremely generous when contributing to collections made for newly-wedded teammates. With his size and strength, he was also known as an outstanding wrestler, pinning most of the team in pre-game wrestling contests. The following year, John hit .284 again and played in 138 of the Browns' 139 games. He led the team in runs batted in (78), doubles (34) and extra-base hits (44). The Browns, however, faltered, finishing the year in sixth place with a 65-74 record. Late in the season, on September 24, 1903, Anderson made the mistake for which he would forever be remembered. During the first game of a doubleheader against the New York Highlanders, the Browns trailed 6-0 going into the eighth inning. They rallied, loading the bases with one out and John on first base via a walk. With the count full on St. Louis hitter Bobby Wallace, Anderson broke with the pitch, Wallace struck out and the catcher threw to first. The first baseman tagged Anderson, completing the double play. The press reported that Anderson had attempted to steal an already-occupied second base, mistaking his aggressive lead for an attempted steal. Unfortunately, this non-attempted steal became Anderson's most famous play. At the end of the season, however, the very same New York Highlanders traded for John, giving up utility man and St. Louis native Jack O'Connor. Playing with New York in 1904, John found himself reunited with former Brooklyn teammate Willie Keeler. Managed by Clark Griffith, the Highlanders finished second, 92-59, one and a half games behind Boston. The season came down to the last Boston series. Although New York lost, John made a spectacular throw from centerfield nailing a Boston runner at the plate. John played 143 games, over 100 games in the outfield and 33 games at first base. He hit .278 and drove in a team-leading 82 runs. Thirty-six games into the 1905 season, with John hitting a lowly .232, the Highlanders sold him to Washington. John spent 1905, 1906 and 1907 with the Senators, hitting .290, .271, and .288, respectively. In August 1907, with the hopeless Senators on their way to a 49-102 record, John deserted the team. Disgusted with the overbearing tactics of the team's new manager, Joe Cantillon, Anderson simply left for home and announced his retirement from baseball. Suspended by Washington, he spent the rest of the summer playing semipro ball and working as a Worcester policeman, and was sold in December 1907 to the Chicago White Sox. Playing his final big league season for the White Sox in 1908, Anderson batted .262 with 21 stolen bases. In 1909, he joined the Providence Grays of the Eastern League, playing first base, hitting .262 and stealing 31 bases. After retiring from baseball, John remained with the police force for about five years, and later worked on his Worcester farm. Married to his wife Emma, a native of Sweden, since 1898, the couple had a son, Frank, and a daughter, Helen. In 1935, he received a silver lifetime pass to all major league games, presented jointly by the presidents of the American and National leagues. He died at age 75 on July 23, 1949 in Worcester, the place where his baseball odyssey began, and was buried there in Swedish Cemetery. John Thorn and Pete Palmer. Total Baseball. Total Sports, 2001. John Anderson's player file, National Baseball Hall of Fame Library. John Anderson's player file, The Sporting News Archives. Bill James. The New Bill James Historical Baseball Abstract. The Free Press, 2001. Mac Davis. Lore and Legends of Baseball. Lantern Press, 1953. Paul Dickson. The New Dickson Baseball Dictionary. Harcourt Brace & Company, 1999. Frank Graham. The News York Yankees, An Informal History. Putnam, 1943. Glen Waggoner. Baseball By The Rules. Taylor Publishing Company, 1987. Robert F. Burk. Never Just A Game. University of North Carolina Press, 1994. US Census 1920, National Archives. "A Fair Fan." Baseball Magazine. October 1909.